You don’t have to be a brilliant detective to know that when you have a popular online Flash game on your hands, it’s a good idea to make it into an app, which is exactly what Moido Games has done. A word game that plays rather like the love child of Scrabble and Mastermind, Wordspector aims to please you wordsmiths who like to mix up words with a bit of mystery. Unlike other word games which give you a bunch of letters and have you make however many words you can, Wordspector just wants you to make one word. There are two basic playing modes in Wordspector, Action and Puzzle, but they both have the same general playing mechanism. You start with a number of blanks, just like in Hangman, and you can make guesses as to what the word will be. If a letter is correct and in the right place, it will show green. If it’s in the word, but not in the right place, it will be orange. If it’s just wrong, it will stay blue. Each guess must be a valid English word, no proper nouns, so you can’t just try letters at random to see what will happen. Naturally, the goal is to figure out the word as quickly as you can. Some levels come with letters already fixed into place, to help nudge you in the right direction, and later levels challenge you with longer and longer words. Action and Puzzle differ in that Action gives you unlimited guesses, but you are racing the clock to find the word, where Puzzle gives you unlimited time, but only a handful of guesses. They’re both challenging in their own way, but unsurprisingly, Action is the much more fast-paced of the two. There are also a small number of mini-games that appear between levels and also as standalone modes accessible from the main menu. “Deduction Derby” has you solving 7 mystery words as quickly as possible. “Anything Goes” is a straight-up, “make as many words as you can with a given first letter” challenge. And finally, “Betweenies” challenges you to find words that fit between a given first and last letter. They don’t really bring anything new to the experience, but they’re still nice little bite-sized bonuses. All things considered, Wordspector is a very solid offering, with very polished graphics, smooth interface, and overall professional finish. Local and online leaderboards, as well as separate Facebook integration means you’ll have plenty of opportunities to challenge friends and strangers to beat your high scores. 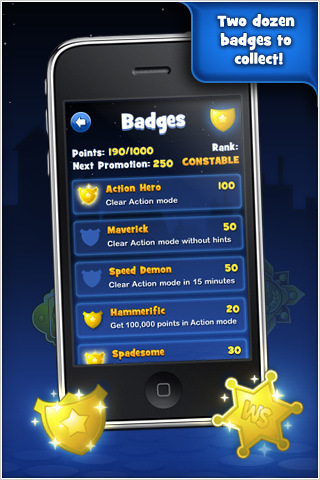 There is no OpenFeint or Game Center integration, sadly, although there is a rather impressive array of in-game badges you can earn. Because it requires a large chunk of brain power pretty quickly, Wordspector probably won’t become an addictive go-to game for those looking for quick fun on the run, but the game still looks, plays, and re-plays very well making it a very worthwhile buy for word game lovers. 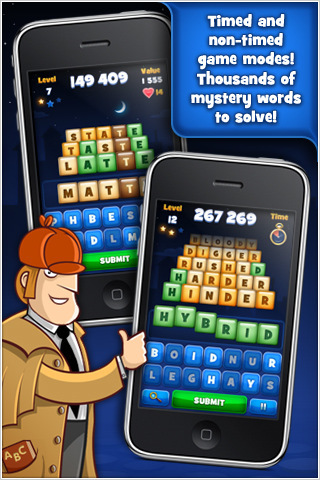 AppSafari review of Wordspector was written by Tracy Yonemoto on December 3rd, 2010 and categorized under App Store, Featured, Games, Mini Games, Word Games. Page viewed 3371 times, 1 so far today. Need help on using these apps? Please read the Help Page.